Dividing it into individual cakes and serving it with roasted tomatoes gives this old favourite a modern twist and makes it a perfect light supper dish. Preheat the oven to 230°C, gas mark 8. Place the potatoes in a large pan of cold water, bring to the boil and cook for 20-25 minutes or until tender. Meanwhile, add the shredded greens to a large pan of boiling water, cover and cook over a high heat for 2-3 minutes until just wilted, then drain thoroughly. Drain the potatoes and return to the pan. Mash with the hot milk and butter. Stir in the spring greens, cheese and salt. Place the tomatoes on a non-stick baking sheet. Brush with 1 tablespoon of olive oil and sprinkle with the garlic, black pepper and thyme. Cook in the preheated oven for 15 minutes. Heat the remaining oil in a large, non-stick frying pan. Divide the potato mixture and shape into 4 rounds, then add to the frying pan and press the cakes to flatten slightly. Cook over a low heat for 8-10 minutes until a crust forms on the underside. Turn the cakes and cook for about 5 minutes or until brown. Transfer the bubble and squeak onto 4 warmed plates. Remove the tomatoes from the oven and place 1 tomato half on top of each portion. Drizzle with the balsamic vinegar. Place the remaining tomato halves in a separate dish and allow people to help themselves to seconds. If you do not have a large enough frying pan, cook the cakes in 2 batches: cover the cooked cakes loosely with foil and keep warm while finishing the others. 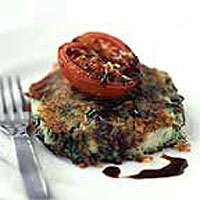 The potato cakes can be made the day before, covered and stored in the fridge. To freeze, shape the cakes, layer them between sheets of greaseproof paper, then store in a freezer-proof container. Allow to defrost thoroughly before frying.